The name Wolfgang Puck is synonymous with the best of restaurant hospitality and the ultimate in all aspects of the culinary arts. The famed chef has built a brand that encompasses three companies: Wolfgang Puck Fine Dining Group, Wolfgang Puck Catering, and Wolfgang Puck Worldwide, Inc.
Puck began cooking as a child, at his mother’s side. She was a chef in the Austrian town where he was born, and with her encouragement, Wolfgang started his formal training at fourteen years of age. As a young chef he worked in some of France’s greatest restaurants, including Maxim’s in Paris, the Hotel de Paris in Monaco, and the Michelin 3-starred L’Oustau de Baumanière in Provence. At the age of 24, Wolfgang took the advice of a friend and left Europe for the United States. His first job was at the restaurant La Tour in Indianapolis, where he worked from 1973 to 1975. In 1975, Wolfgang came to Los Angeles and very quickly garnered the attention of the Hollywood elite as chef of Ma Maison in West Hollywood. His dynamic personality and culinary brilliance that bridged tradition and invention made Ma Maison a magnet for the rich and famous, with Wolfgang as the star attraction. He had an innate understanding of the potential for California cuisine, and was pivotal in its rise to national attention during the late 1970s. From Ma Maison, Wolfgang went on to create his first flagship restaurant, Spago, originally located in West Hollywood on the Sunset Strip. From its opening day in 1982, Spago was an instant success and culinary phenomenon. His early signature dishes, such as haute cuisine pizzas topped with smoked salmon and caviar, and Sonoma baby lamb with braised greens and rosemary, put him and Spago on the gourmet map, not just in Los Angeles but throughout the world. Wolfgang and Spago earned many accolades during its popular eighteen years in West Hollywood, including winning the prestigious James Beard Foundation Award for Outstanding Chef of the Year, twice, in 1991 and 1998, and the James Beard Foundation Award for Restaurant of the Year in 1994. Wolfgang is the only chef to have won the Outstanding Chef of the Year Award multiple times. In 1983, following the success of Spago, Wolfgang went on to open Chinois on Main in Santa Monica. His early exposure to Southern California’s multicultural population intrigued him, inspiring him to fuse the Asian flavors and products of Koreatown, Chinatown, and Thai Town with his French and California-based cuisine in a fine dining setting. Chinois on Main brings diners a fresh and imaginative Asian-fusion menu that laid the groundwork for fusion cooking in America. Wolfgang opened his third restaurant, Postrio, in the Prescott Hotel off San Francisco’s Union Square, in 1989. Throughout its 20 years in business Postrio drew upon the multi-ethnic nature of its surroundings. After 15 successful years in West Hollywood, Wolfgang moved Spago to an elegant setting on Canon Drive in Beverly Hills, in 1997. His menu blazed new ground, with a combination of updated Spago classics and newly conceived items created by the award-winning talents of Managing Partner Corporate Executive Chef Lee Hefter. The seasonal menu drew inspiration from Wolfgang’s favorite childhood dishes, offering a selection of Austrian specialties such as Wienerschnitzel and Kaiserschmarren. Spago Beverly Hills garnered two coveted Michelin Stars, one of only three Los Angeles restaurants to achieve this accolade. In 2012, Wolfgang fearlessly transformed Spago through a complete renovation in both menu and design. In 2006, Wolfgang opened CUT, a sleek, contemporary steakhouse at the acclaimed Beverly Wilshire, a Four Seasons Hotel. After only one year, CUT earned a prestigious Michelin star among numerous other top accolades including Restaurant of the Year by Esquire Magazine from noted food critic John Mariani. Wolfgang has changed the way Americans cook and eat by combining classic French techniques with California and Asian influences as well as the freshest and finest ingredients. He has also changed the face of dining in cities throughout the nation, first in Los Angeles, then in Las Vegas, where he was the first star chef to create a contemporary fine dining restaurant, paving the way for other celebrated chefs and the city’s metamorphosis into an acclaimed dining destination. 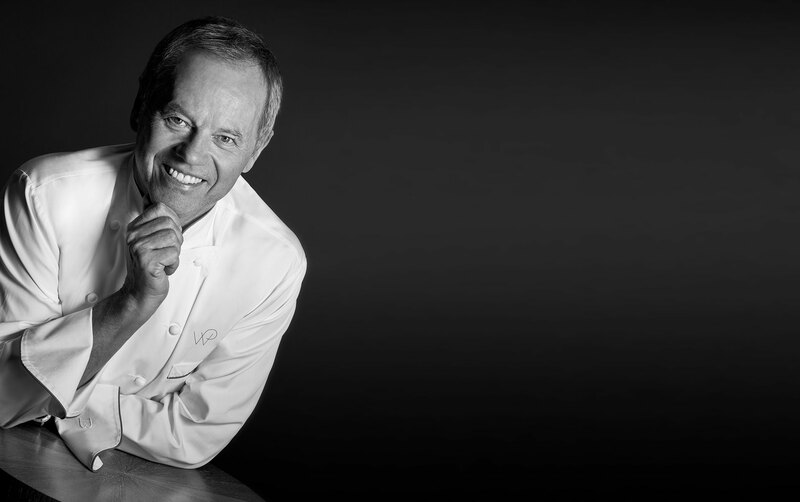 After opening Spago in the Forum Shops at Caesars in 1992, Wolfgang went on to open six additional restaurants in the Las Vegas including the now closed Postrio Bar & Grill at The Venetian in 1999, Trattoria del Lupo at Mandalay Bay Resort and Casino in 1999, Wolfgang Puck Bar & Grill at MGM Grand in 2004, CUT at The Palazzo in 2008, Cucina by Wolfgang Puck, located in The Shops at Crystals in 2010, and his first off strip restaurant, Wolfgang Puck Bar & Grill, in the burgeoning neighborhood of Downtown Summerlin. Since 2001, Wolfgang and his Fine Dining Group have opened restaurants across the United States from Atlantic City (Wolfgang Puck American Grille at the Borgata Hotel Casino & Spa in 2006) to Maui (Spago at the Four Seasons Resort in 2001). These also include The Source in Washington, DC (2007), Wolfgang Puck Steak and Wolfgang Puck Pizzeria & Cucina at MGM Grand Detroit (2012), Spago at The Ritz Carlton, Bachelor Gulch in Colorado (2007), Five Sixty by Wolfgang Puck at Reunion Tower in Dallas (2009), Wolfgang Puck Bar & Grill at L.A. Live (2009) and WP24 by Wolfgang Puck at The Ritz-Carlton, Los Angeles (2010). In 2010, Puck took the Fine Dining Group international with the opening of CUT at Marina Bay Sands in Singapore. In September 2011, Puck opened his first European venture, CUT in London at the new 45 Park Lane from The Dorchester Collection and in October, Puck furthered his relationship with The Dorchester Collection by overseeing the food and beverage operations at the historic Hotel Bel-Air including the property restaurant, “Wolfgang Puck at Hotel Bel-Air,” plus in-room dining, catering and events. In spring 2014, Puck made his first foray into the Middle East with the debut of CUT at The Address Downtown Dubai. The opening of Spago at The St. Regis Istanbul in 2015 marked Wolfgang’s first international location of this famed concept, as well as CUT, and his most recent concept re/Asian Cuisine at the Four Seasons Bahrain Bay. His most recent international location Spago Singapore opened within the Marina Bay Sands hotel in the summer of 2015. A number of new fine dining restaurants are in development in Europe, Asia and the Middle East, as well as two in the United States. Wolfgang formed Wolfgang Puck Catering (WPC) in May 1998, alongside partner Carl Schuster. The company brings a new level of innovation and inspiration to special event and contract dining services for cultural, corporate and entertainment venues across the country. WPC offers a restaurant-quality experience in a special event setting for such high profile events as the annual Governors Ball, where Puck has been honored to serve as official chef for the post-Academy Awards® celebrity banquet for over 20 years, as well as global business summits, film premieres, and presidential galas. WPC also is responsible for operating iconic cultural and architectural venues in major markets including L.A. LIVE, Sony Pictures Studios, NBCUniversal Studios, Rose Bowl Stadium, Hollywood & Highland Center and Dolby Theatre, and Pacific Design Center (Los Angeles); Perot Museum of Nature and Science, Union Station, Reunion Tower, Nasher Sculpture Center and AT&T Performing Arts Center (Dallas); University of Chicago Gleacher Center and Venue Six10 (Chicago); Museum of Science and Institute of Contemporary Art (Boston); The Fillmore (Philadelphia); EMP Museum (Seattle); Newseum (Washington, DC); The Sunset Room (National Harbor MD); and Georgia Aquarium (Atlanta). WPC provides creative, personalized in-house dining for Fortune 100 companies and studios. WPC’s strategic partnership with Compass Group has fueled its continued growth since 2004. Wolfgang Puck Worldwide, Inc. is a privately held corporation that includes a rapidly growing portfolio of company-owned and franchised locations of casual dining and fast-casual restaurants, as well as consumer products including Wolfgang Puck packaged food and beverages, book publishing, and other licensing and merchandising projects. The Wolfgang Puck casual dining segment includes a wide variety of concepts in varying venues globally. From airports and universities to hospitals, casinos and street-side restaurants, these concepts include over 50 locations with a portfolio that continues to expand. The menus rotate new, seasonal specials throughout the year, highlighting the local produce of the season, as well as organic options where possible. Locations featuring a bar also include a boutique wine list and cocktails developed by Wolfgang’s beverage team. Concurrently with his restaurant and catering operations, Wolfgang Puck has made a name for himself as a communicator. He has been a regular guest on ABC’s Good Morning America since 1986, the year he also produced his first instructional cooking video, Spago Cooking with Wolfgang Puck. His Emmy Award-winning television series, “Wolfgang Puck,” debuted on The Food Network in 2000 and aired for five seasons. Wolfgang also has made guest appearances on a multitude of television shows including The Late Show with David Letterman, The Tonight Show with Jay Leno, The Late Late Show with Craig Ferguson, The Ellen De Generes Show, Entertainment Tonight, E! Entertainment Television, Hollywood Squares, Politically Incorrect with Bill Maher, Frasier, The Simpsons, The History Channel, Wheel of Fortune, Las Vegas, Shark and What’s My Line. In 2001, the A&E Network featured the life of Wolfgang Puck on their popular Biography series. Wolfgang has written seven cookbooks including his latest book, “Wolfgang Puck Makes it Healthy” which debuted in spring 2014. His latest endeavor is the Wolfgang Puck Cooking School which launched in 2016 and offers home cooks a comprehensive and ever-growing online collection of instructional recipes, how-to techniques and more. Wolfgang’s syndicated newspaper column, “Wolfgang Puck’s Kitchen,” appears in 30 newspapers in the United States and Canada, reaching more than 5.3 million people each week. The chef is known to millions of television viewers who see him regularly on Home Shopping Network (HSN), where he demonstrates recipes using his growing line of Wolfgang Puck branded housewares. These include stainless steel cookware, small kitchen electrics such as panini grills, food processors, blenders and electric grills, flatware, cutlery, bakeware, his breakthrough pressure oven and other kitchen gadgets and tools. In addition to his branded housewares, Wolfgang Puck’s consumer products include a wide range of foods. He launched his first line of frozen food in 1987 to meet his customers’ desire to enjoy Spago-quality food at home. Currently available are Wolfgang’s All-Natural and Organic Soups and Estate Grown Organic Coffees. Gelson’s supermarkets in Southern California offer Wolfgang Puck fresh-packaged foods, and Wolfgang Puck coffee blends which are sold through Amenity Services to hotels, resorts, local market office distribution and websites. Wolfgang Puck lives in Los Angeles, with his wife, Gelila, and has four sons, Cameron, Byron, Oliver and Alexander.